The world is facing problems because of shortfalls of energy. 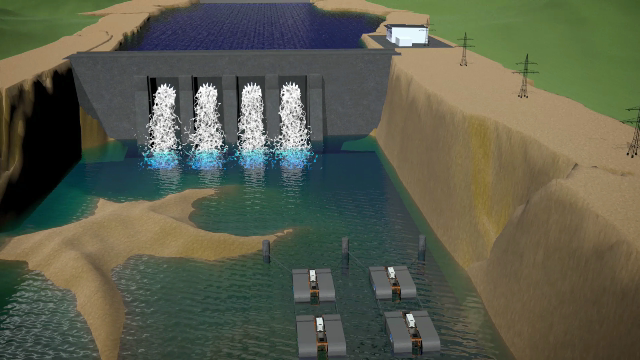 Some thoughtful energy companies are working to harvest important benefits of renewable energy with the capability to capture continuous tidal power using river turbine and hydroelectric generator. The Tidal Current Surface Crawler (TCSC) is a floating surface device with no requirement for specialized vessels or ocean foundations, making heavy lift equipment unnecessary. In Patent language, the TCSC is the Endless Belt Generator, a floating surface device that can capture the kinetic energy from a moving fluid. Being totally linear in its application, and being extremely competitive with other energy capture devices like river turbines, it is particularly useful for remote communities that are proximate to flowing water as in tidal currents and river currents. This will offer great opportunities to convert from diesel powered electricity to this renewable and sustainable energy source. The Endless Belt Generator provides the most efficient means of extracting some of the available kinetic energy, far surpassing the efficiency of tidal current turbines. From a basic design, we have evolved to a state of the art machine that is built to withstand the challenging marine environment, with safety for marine life as well as service operating staff. With several ocean tests under our belt, we have proven the concept and the potential to capture energy from a ocean or river current, without the need for expensive machinery to deploy and operate. 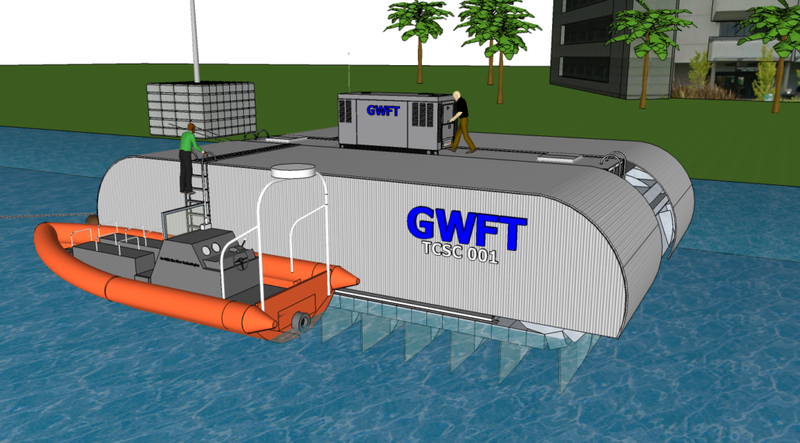 In a river flowing at 7 miles per hour(6 knots), the full size TCSC can produce 250 kilowatt. And since a river or ocean current doesn’t stop flowing when the sunset happens, the TCSC can serve as a continuos source of power. Everything on the TCSC is designed with safety in mind, simplicity and durability. The paddles are fed by gravity when they enter the water and lock in place to capture the energy. They fold and lay flat as they exit the water, keeping a low profile of the entire unit. Debris can flow directly under the TCSC without causing any damage or harm to the paddles or the machine. The entire weight of the TCSC is supported by the buoyant forces of the floats attached to the chains. Rather than plowing through water, all the weight moves with the current and contributes to the energy extraction. 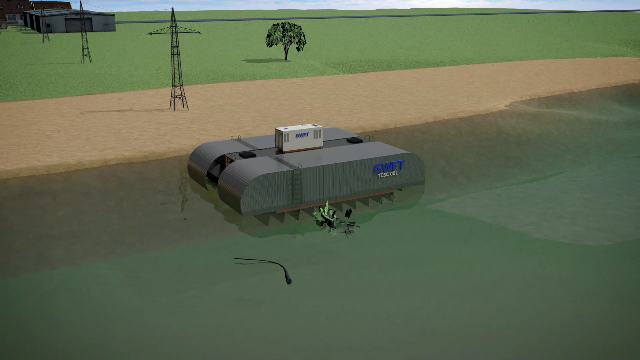 Unlike a hydroelectric dam which floods a wide area, the TCSC crawler can be installed anywhere there is enough current to rotate the Endless Belts. 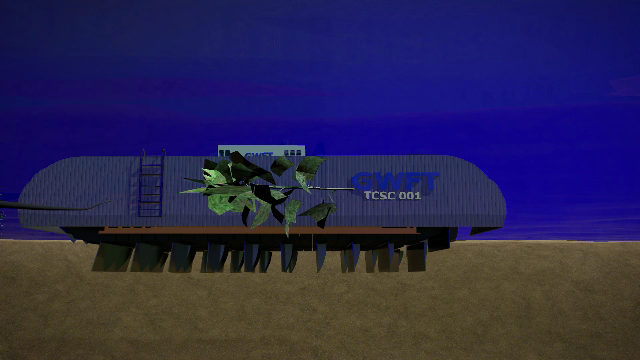 Deployment of the TCSC only requires an average size Tugboat and a two man crew whereas to deploy a turbine requires massive ships with cranes and a large crew. All generating components are mounted above water in dry waterproof compartments that can be accessed and serviced safely while the machine is operating. Relocating the machine is as easy as towing a barge. 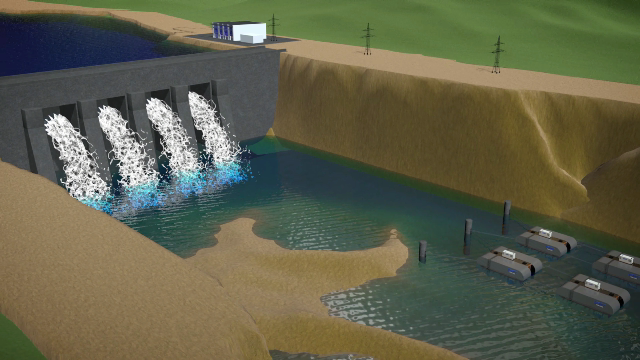 The TCSC requires less initial investment and materials than other river turbines and hydro power generators. Feasible and efficient, the TCSC represents a state-of-the-art innovation in tidal energy technology. The TCSC does not need a dam or special run-of-river installations so; it reduces the construction cost, saves resources and time as well as reduces the land use. Equipped with multiple smart features, allowing it to function in multiple locations where there is sufficient current, the TCSC represents the future of renewable energy throughout the world. It is environmentally benign causing no harm to marine and avian life. Deployment does not require large machines, and deployment locations become protected fish habitats. Marine life is safe as the TCSC belt rotates at approximately half the speed of the current. With strong grip in the water the conversion to fast generating RPM happens on top of the deck. Turbine blades, on the other hand are a potential danger to all marine life. For any kind of inquiry, please feel free to contact us.